Back – way back – in the midsts of time, we used to publish a little Twin Peaks fanzine/newsletter thing; a youthful endeavour that not very many people read but which kept us out of trouble. With the internet only just beginning to reach out beyond university campuses, and discussion largely limited to e-mail newsletters and newsgroups, the printed word was still the mechanism by which many film and TV aficianados got much of their information, with a flourishing fanzine scene offering independent and more in-depth coverage than the mainstream genre press. For Twin Peaks fans, Wrapped In Plastic became the go-to publication, setting the benchmark for study of the show. Over 75 issues, WIP – under the steady hands of Craig Miller and John Thorne – delved deep into the show’s history and mythology, interviewing key cast and crew members and bringing a scholarly approach to the analysis of genre television. They even let me write for them on occasion, the fools. With David Lynch and Mark Frost’s revival of the cult series only days away, anticipation is about to reach fever pitch. A new version of my own TP ‘zine was planned – and will eventually appear! – but, y’know, life. Meanwhile, John Thorne has returned to the fray with a new venture, The Blue Rose, not necessarily as a replacement for WIP, but as a distinct publication in its own right, tweaked to acknowledge the realities of magazine production in the digital age. We caught up with John a few months back with the intention of using the interview in the ‘zine, but as the premiere approached, thought it better – and fairer – to just get it out there. What’s been your relationship with Twin Peaks since putting Wrapped In Plastic to bed? Was it something you kept thinking about and returning to? I did think about Twin Peaks for some years after Wrapped In Plastic ended and occasionally wrote about the show on my blog. But the more time that passed after Wrapped In Plastic was done, the further away I got from the show. For some time it looked like David Lynch was not creating anything new (this was after Inland Empire) and Mark Frost was content to write about sports. I did keep thinking about it, and I would still get correspondence from various people about Twin Peaks and Wrapped In Plastic. 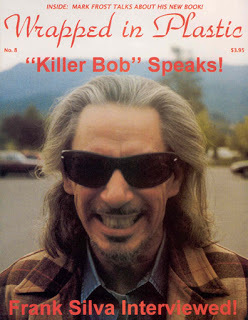 But after Craig passed away [in 2012] I thought my time with Twin Peaks was over. It was like a chapter had closed and I had moved on. I never expected to be fully involved with thinking and writing about it again! I never expected Twin Peaks to return to television. David Lynch had been adamant in various interviews that he was done with the work. I think he even went as far as to say that Twin Peaks was “dead.” So, if anyone ever asked me, I always said it was over. In fact, I had given an interview to Joel Bocko just weeks before the announcement about the return to Showtime and I said I did not expect the show to ever come back. Joel had to contact me after the announcement so we could put an addendum out to my interview! And when the unthinkable became thinkable? I immediately started thinking about WIP. And, of course, I started getting inquiries about putting Wrapped In Plastic back out again. But I knew I couldn’t do that without Craig. It just wouldn’t be the same, and I wasn’t really sure what I wanted to do. After a short while, I realized there was a great deal of material in WIP that was out-of-print and inaccessible to many new fans. So I decided to put a book (The Essential Wrapped In Plastic: Pathways to Twin Peaks) together that would collect some of the better material about Twin Peaks from WIP in one place. With WIP – and its sister title Spectrum – you covered other interesting shows like American Gothic, but I find it fascinating we’re here 25+ years later talking about TP and not AG. It’s clear TP has continued to find new viewers, many of them much younger than we are (!) and yet their enthusiasm for that world is just as intense as those who watched first time around. Even with the X-Files revival, the anticipation didn’t seem to catch people’s imagination in the same way. No, it didn’t. There is something special and different about Twin Peaks. It captures the imagination like few other shows. It’s such a rich work! There are so many different ways to approach it. It is a timeless classic and is far more demanding and intriguing than many of the successful series that followed it, such as The X-Files. As I’ve said before, new generations will continually discover Twin Peaks. I think it’s a college thing, too. When you’re that age, you’re exploring unique and demanding art, such as books and television and film. And you inevitably come across Twin Peaks. That’s where the show hooks new viewers. Something you did with WIP (and subsequently Spectrum) was to treat TV to the same level of serious criticism that cinema has had for decades. Lynch’s involvement in TP made it OK for critics to go there, but we’ve also seen a significant rise in the number of shows that justify that level of scrutiny. Had WIP/Spectrum continued during these intervening years, which titles have you enjoyed the most, to the extent that you might have wanted to write about them had that platform still existed? There are so many good shows to write and talk about. A few that come to mind are The Wire, Deadwood, Breaking Bad, True Detective (season one) and Fargo (season two). The difference between some of those programs and Twin Peaks, however, is that they don’t quite engender the same kind of passion that you see in Twin Peaks fans. Sure, there are many people who flock to the filming sites for Breaking Bad, and there are many websites devoted to discussing it and analyzing various aspects of it, but it falls squarely in one particular genre. The Wire is certainly the same way, even though it is a brilliant piece of work. I think that’s why Twin Peaks appeals to so many people: it does not fit into any one genre; in fact, it straddles a great many. Plus it has such a subjective quality. On Breaking Bad, almost every viewer can say, “This is what happened to Walter in such-and-such an episode.” But for Twin Peaks we can’t say with certainty what happened to Major Briggs when he went missing, or what happened to Josie when she died. We all have theories and ideas. Still, Fargo and True Detective are shows that pushed that boundaries between mystery and the supernatural and would certainly be shows I would write about. They had a lot to offer. Another fascinating show, which has only been on for a scant 13 episodes, is The Good Place, a comedy on NBC. That show has quite a bit of depth which you might not expect. You’ve just announced your return to regular Peaks publishing with The Blue Rose. What was the trigger for that decision and, given the incredible rise in digital culture – even since WIP folded – have you had to rethink your approach to putting a magazine together? I have to give all of the credit here to Scott Ryan who proposed the idea and has done all the heavy lifting to get the new magazine off the ground. He researched online-design and delivery and also did most of the work determining how and where to print the hard copies. He is really driven to see this done right. I’ve been involved in writing and editing for the first issue. I think I will be doing more for the second issue, but we’ll be sharing the editing duties as we go. Yes, for sure you have to rethink the approach to putting out a magazine. Today, information is basically instantaneous and free. Why would someone want to pay for a TP mag? Well, we hope the articles will be substantive and the interviews interesting. Personally, I love to do research on an article and back up an argument with sources and footnotes. It gives the piece some weight and makes it a lasting contribution to TP scholarship. Hopefully we will have some of that in every issue, along with news, interviews and lighter pieces as well. Is there anything you now know about TP that you didn’t know back then? And if so, has it made you reconsider how you feel about the series at all? I am still learning about Twin Peaks. There always seems to be something new and interesting to look at. Just recently I’ve given thought to how Lynch frames shots and how he positions the heads of characters in the frame against certain backgrounds. There are some fascinating things to look at in this regard. Also, in my discussions with Joel Bocko, I’ve come to realize that part of what makes Twin Peaks a lasting curiosity is how it resulted from a TV-network dynamic and a clash of creative impulses. Fans today still try reconcile various oddities about the series when, in fact, many of them were accidents or the result of a hasty production schedule. The second season fascinates us more than the first because the show goes wildly off the rails for a while and then gets back on track (and yet all of that “craziness” is folded into the mythology). You don’t see this as much in the first season, which was a more focused production. Do you have any concerns about the new episodes? Hopes? Hmm. I believe the show will be quite challenging and potentially hard to reconcile with what has come before. There may be blatant contradictions in the narrative that will take time and study to understand. But it will again be David Lynch and Mark Frost making something unforgettable and utterly unique. Copies of The Blue Rose are available to order from the publication’s website. Having grown reading John’s WIP and Douglas’s Feb 24 zine i was beyond excited reading this interview.